On a year spent following the far-right nationalist as he becomes a man without a country. Marie Therese Guirgis had been anxious to hear what Alison Klayman thought. 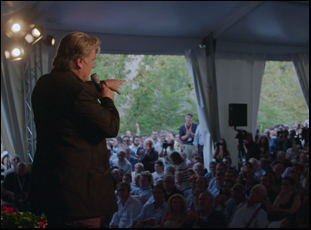 The producer knew patience was part of the deal if “The Brink” were to come to fruition, already having asked Steve Bannon, her former boss at Wellspring Media during his first foray into indie filmmaking, on three separate occasions if she could make a film about him in his new life as an adviser to far-right nationalist movements around the world, and turned down each time. Now, after getting him to agree to do the film after he left his post in the Trump White House, it felt like an eternity to hear whether the director of “Ai Weiwei: Never Sorry” and “Take Your Pills” would commit to the project after she arranged a meeting between the three and Klayman virtually didn’t say a word until she and Guirgis were back at the train station. “I think you were shell-shocked,” laughs Guirgis. It likely was the only moment during the making of “The Brink” in which Klayman could be described as passive, well-aware of the issues inherent in returning to the seemingly nonjudgmental verité style of “Never Sorry” to profile one of the architects of the disastrous Muslim ban that was implemented during Trump’s first 100 days in office and has tried to replicate the success of his xenophobic campaigning abroad. 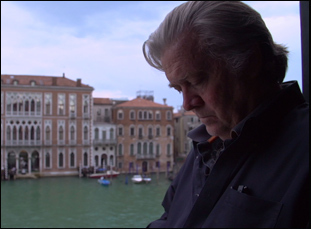 However, rather than give Bannon a platform, Klayman bears witness to his attempts to build one across continents as he sets up dinners with various fringe players around the world such as Brexit advocate Nigel Farage and exiled China billionaire Miles Kwok after largely wearing out his welcome in America. Although there is cold comfort in seeing how Bannon’s advocacy of isolationism is most successfully deployed against himself as candidates he endorses start to fail and he gets less traction in the media over the course of the year leading up to the U.S. midterms, “The Brink” uses its access to reveal many truths about the political animal who values process more than policy and the current political moment that allowed for his rise to prominence, with his recognition that if you build a “small but solid minority that is immovable,” which he credits to his time in the Navy and Goldman Sachs, you can achieve real power in culturally splintered times where stasis can be seen as progress. Following Bannon around as he does the unglamorous work of coalition-building, embracing his scruffiness and lack of decorum as a sign of being a man of the people in public while he flies on private jets and drinks Kombucha, Klayman’s unflinching camera captures one contradiction after another, shrewdly observing the selective history he and his team draw on to outline their vision for the future and how he is constantly engaging in the identity politics he says he deplores. On the eve of “The Brink”’s release, Klayman and Guirgis reunited in Los Angeles to talk about collaborating on a film that few knew was actually in the works until it premiered at Sundance this past January, the challenge of tracking someone so all over the map literally and figuratively and how Klayman put her personal stamp on the project. The film’s opening scene grows more remarkable as the film wears on since it gets to the heart of who Steve Bannon is almost instantly as he talks about the making of “The Torchbearer,” a film he made with Phil Robertson of “Duck Dynasty” fame. It’s disarming since you can see he has a sense of humor about himself and can barely remember what happened two years ago when the film was shot, but he also talks about how he admires the Germans’ physical engineering of concentration camps without regard for what happened there. It does so much work for the rest of the film — how did you get that moment? Alison Klayman: Yeah, that was one of those examples where sometimes in the course of filming a verite, long-term project, you know in a moment not just that’s something’s good, but in that case, this could be the open. It was pretty late [in the shoot]. It was the summer of 2018, so I’d already been filming for many months and that story came up appropos of nothing. I didn’t ask a question on that topic. He had meandered his way from remembering that movie, which is so funny – [he can’t remember whether the title was] “‘The Torchbearer’…or ‘The Torchbearers’?” And when he’s listing all the places [they shot], he hits on Auschwitz. And maybe he was trying to provoke me because he knew that my grandparents were Holocaust survivors, but I recently had come to the conclusion of what’s going to make this film a film that I’m doing as opposed to any other filmmaker, besides the mechanics of it and my style, was that personal interest in questions of banality of evil and how a society gets to a place where hate is not just enshrined in the law, but it’s a currency in the public sphere. That was something that interested me and I knew that eventually is why I said yes [in the first place] – that and a chance to contribute something in this terrifying political moment. Marie Therese Guirgis: Now it’s even more absurd. Marie Therese Guirgis: Yeah, I remember Alison first showed me that, and I knew she felt strongly about it, but I totally agreed. My first thought is like, “Wow, this is a provocation. There are people who are going to [just] hear Steve Bannon utter the names of those concentration camps [and it’s] going to be a provocation.” That’s the part of me that comes from fiction filmmaking originally and I thought besides all the other reasons [it worked as an opening], like this is cinematic, this is bold, this is interesting. Alison Klayman: And that’s why Marie Therese is a good producer because she not only gets it, but supports me as a director. There was a lot of finessing to make it work as an open, but I think we nailed it. Like you said, everybody understood it does so much work because it brings you into his world. It makes you feel his physicality, his way of speaking, his demeanor, and then for me, it’s a very interesting way to start a movie that shows there’s an author behind this verite film. Sometimes people don’t always understand all the choices that are made [when it’s verite], so it felt like that was going to be a really good thing and it brings you into my feeling personally because as an audience member, you may be thinking “Where is this story going?” and that’s how I felt sitting there. While Bannon is traveling all over the world on private jets, was this logistically challenging to keep up with him? Marie Therese Guirgis: It was crazy. The two of us were working on this for a very long time alone and this is something I did know about him beforehand, but I didn’t know how crazy it would be in this context – everything he does is by the seat of his pants. There’s very little organization. He’s impulsive, always has been. He decides and controls everything – no one makes schedules for him. So everything is last minute. And between us, we were like, “Well, he won’t tell me. Can you find out?” Like “where is he going to be tomorrow?” His own staff wouldn’t know where he was. So there were many things I really respect about Alison’s work on this and one of them was there were times where we’d be on the phone and she wouldn’t really know where she was going to wake up the next day. Alison Klayman: Yeah, that was really hard and it was another way being a one-person crew was an advantage because you’re only trying to fit one person in the backseat of the SUV or the jet. We wanted that for access, but it also would’ve been impossible to cover him flying commercial. One day we literally went from Rome to Prague and to Budapest and back to Rome the same day, and you just couldn’t achieve that [other than on a private jet]. So it was really challenging, but honestly, I feel it showed the cooperation [we had] because they often didn’t know things until the last minute, but they would facilitate me having that extra seat because we really made clear I don’t know how to do this otherwise. Feel free to disagree with the premise, but was it different to follow someone you didn’t admire than someone you do? Alison Klayman: It could sound unbelievable, but there’s a lot that’s very similar. Now, it wasn’t like I was fundamentally opposed to his worldview, but when I started following Ai Weiwei, I don’t know that I would say I admired him. To be totally honest, I didn’t know a lot about him. I saw that he was a big personality and he spent a lot of time talking to press. His company was called Fake Studio and he loved messing with people. He’s a provocateur as well, and I thought the project I was on was to get beyond the people who come in and meet him and just do one sit-down interview. I wanted him to reveal himself to me and I didn’t come in with a lot of preconceived notions because I feel that’s the right way to do any kind of film. So with Bannon, it was similar in the sense that I don’t know anything about how he is personally. It all has to be revealed to me. I’m going to be highly skeptical of everything, like is this for the camera? What is he really doing? The big difference is yes, I came in with my own values, my own politics and my own worldview [which] I think it’s different than being like I’m going to treat him fairly and start as a clean slate in terms of what he’s going to do and say – I didn’t know what he was going to do and say. Marie Therese Guirgis: What about in the editing? I bet you treated him differently a little bit than people you “admired.” Like you had certain concerns, right? Or responsibilities? Alison Klayman: By the time you’re editing, it’s no longer a blank slate when it comes to him. I’ve now made some informed opinions about him and I have the material that I have and I regard that with an incredible sense of responsibility. What I chose to put in there had to tell the story that shared my conclusions and my experience of him over the year. Everything is very carefully chosen [as far as] what part of him are we showing, what lines am I putting in. For example if I think he’s doing something dishonest, but I don’t have a way to show that it’s dishonest, maybe I shouldn’t put it in because maybe this could be misinterpreted as just this is just the honest truth. So [in “The Brink”] there’s a lot of [formal] devices in terms of juxtaposition, in terms of inviting the audience to be looking at him and not taking it as this movie is me trying to have him talk to the audience. With “Never Sorry,” it was more of a mix because in the end I did find that [Ai Weiwei] was genuine in his beliefs and I agreed with what he was trying to provoke in people through his art. For example, [Ai Weiwei’s] own [voiceover] is contextualizing what you see. That’s a very typical device in documentary, but in this film, if you look closely, there might be like one time where we let that happen, but basically that never happens because I’m trying to be like, “You are looking at him” because he’s not contextualizing his world for you. I’m not here to facilitate that. I’m here to put him under a microscope. And that was the big difference. “The Brink” opens on March 29th in Los Angeles at the Landmark, New York at the IFC Center and the Landmark at 57 West and the Washington D.C. at the E Street Cinema. A full list of theaters and dates is here. SXSW '19 Interview: Hilary Brougher & Talia Balsam on Climbing to the Highest Heights in "South Mountain"